Eastway Drive reopened recently after a 16-month LYNX bridge project. It’s a great time to explore international cafes and groceries along this diverse east Charlotte corridor. Want to sample Liberian food? Visit Nubian Queens. How about some Guatemalan baked goods? Try Panaderia El Quetzel. Vietnamese eats? Go to Lang Van. For Central American homestyle food, it’s Deli La Cabaña. 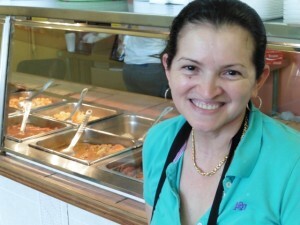 Behind the counter you’ll usually find the co-owner, tiny Elba Villatoro. She and husband José bring recipes from her home village of Santa Rosa de Lima in El Salvador. “No formal training — what I learned as a little girl,” says Elba. It’s grandma cooking: simple, hearty stews like your abuela would simmer all day long in a big pot at the back of the stove. Nothing’s spicy, all cafeteria style, so just point at what looks tasty. Look for carne guisada: beef with big chunks of potato and carrot in a mild tomato broth. Or hilachas: shredded skirt steak cooked with tomatoes, tomatillos and onions. Don’t miss the pastelitos: little cornmeal empanadas stuffed with shredded chicken, potato and carrot. “It’s the food we ate growing up in Guatemala — flavorful stewed meats and vegetables served alongside rice and thick hand-made corn tortillas,” says UNC Charlotte professor Eric Hoenes. A few folding tables and chairs line the small space but most folks are waiting for takeout — Central American men in work clothes, moms with kids.